As described in the final report, the network connectivity analysis showed that approximately 51% of the population of Wyoming (about 300,821 people) is served by national ICB service providers, including 17 of the 28 largest cities in the state. 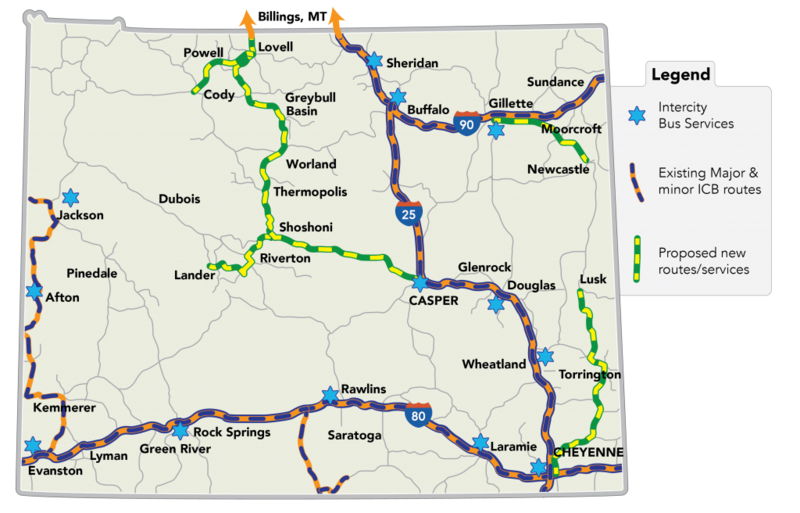 The results from the network connectivity analysis and the survey were used as a basis to help define “meaningful connections” and six specific routes that could expand access to intercity bus services in Wyoming. This research also provided a methodology that can be used by WYDOT to determine intercity bus service needs are being adequately met. The methodology consists of an annual process to support existing intercity bus services and a triennial process to determine if there is the need for new services. The goal of this project is to provide an assessment of current intercity bus (ICB) services in Wyoming and identify areas of the state with unmet ICB needs. The goal of this project is to provide an assessment of current intercity bus (ICB) services in Wyoming and identify areas of the state with unmet ICB needs. This study will also provide a methodology that can be used by the Wyoming Department of Transportation (WYDOT) to determine if ICB service needs are being adequately met; and if not, a process to identify potential new routes/services, and recommendations for funding allocations to establish new services. The study will also identify any deterrents to intercity bus service in Wyoming. A discussion of current best practices used by similar rural states to increase and improve ICB will also be included.